Key Australian government officials sounded early warnings about the rapidly deteriorating situation in East Timor in the late 1970s that led to the starvation deaths of an estimated 100,000 people, recently-released diplomatic cables reveal. More than 100,000 refugees are thought to have died in the late 1970s famine in East Timor. The cables, sent from Jakarta, warned over several months about the looming human catastrophe, caused by the Indonesian military’s campaign against the Fretilin independence movement. They add weight to accusations that Australia and its allies were slow to act in a bid to avert the tragedy. The former Prime Minister Malcolm Fraser, who was in power at the time, expressed concern when shown the documents by The Citizen, claiming key intelligence had not been brought to his attention. He said Australia should have acted to provide humanitarian aid to starving Timorese. “I would like to know who should have acted and didn’t,” he said, referring to the Canberra bureaucracy. Mr Fraser added that the government “should have been asking for United Nations monitoring and observations to keep a watch on East Timor”. The warnings about the military-induced famine came in a series of briefing notes. Indonesia’s then-Defence Minister, General Mohammad Yusuf, told Australia’s ambassador in Jakarta in June 1978 that his forces were struggling to care for the 270,000 Timorese women and children who had been “separated from their menfolk” as a result of the military crackdown. 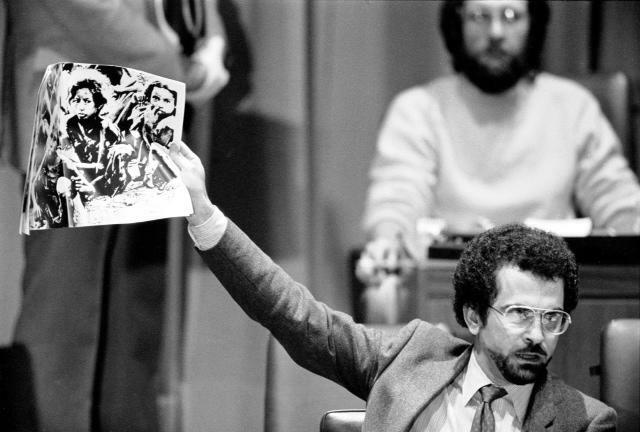 Embassy officials also saw photographs depicting “many sick, starving and malnourished women and children, typical of famine scenes throughout the world”, according to a report filed on August 15, 1978. 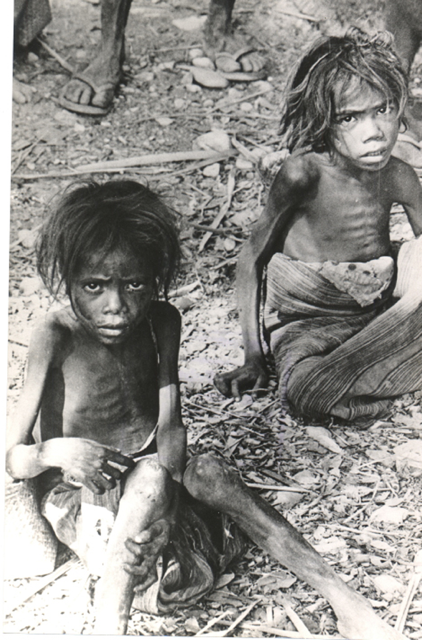 Earlier, in May of that year, the first secretary at the embassy, David Irvine, who is now the director-general of ASIO, reported being told by Indonesian Brigadier-General Adenan that Fretilin supporters were “suffering lack of both ammunition and food” and “were in poor physical condition”, and that “some could not even stand”. However, it was not until the end of the following year – 16 months after evidence of starvation started emerging — that a humanitarian rescue mission swung into action. The previously classified documents were obtained from the National Archives by the noted Timor researcher and University of NSW academic Clinton Fernandes, who claims the material points to Australian complicity in Indonesia’s oppression of the former Portuguese colony. However, it is not clear whether any of the briefing notes sent to the Department of Foreign Affairs in Canberra were on-passed to individual ministers or made known to Cabinet. Dr Fernandes, a former army intelligence officer, claims the partly redacted documents also indicate that Australia was aware that Indonesia was using Australian-built Nomad aircraft for military purposes in Timor despite having received assurances to the contrary from Jakarta. He also believes they point to Canberra helping to keep secret the whereabouts of the mother of the pro-independence leader Jose Ramos-Horta as part of the military dictatorship’s attempts to “keep him guessing”. However, Mr Fraser rejected the notion of Canberra’s complicity, arguing that Australia was “powerless and played” by Indonesia and that the documents were inconclusive about what was known and by whom. Australian government officials are currently fighting against a further release of documents that could shed additional light on Australia’s part in the controversy, a ruling that Dr Fernandes is challenging before the Administrative Appeals Tribunal. A hearing is expected early next year. Although the documents could be declassified under the 30-year archives rule, the Department of Foreign Affairs and Trade (DFAT) claims their release could compromise Australia’s security, defence or international partnerships, especially its US ties. An affidavit sworn by a DFAT official in July revealed that the US was insisting on keeping confidential the material under its intelligence sharing agreement with Australia. 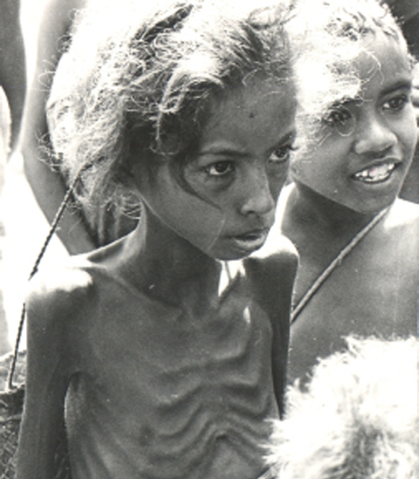 The additional documents being sought relate to events in East Timor between 1977 and 1982 when the invasion and subsequent dislocation of farmers led to famine, the effects of which were exacerbated by Indonesia’s refusal to allow the International Red Cross to provide assistance and food aid. Estimates of the death toll vary around 100,000, although Dr Fernandes is convinced that it was likely double that figure. East Timor’s Commission for Reception, Truth and Reconciliation reported in 2001 that between 1977 and 1979 the Indonesian military employed “chemical weapons which poisoned water supplies, killed crops and other vegetation, and [used] napalm bombs and other incendiary devices, whose effect was to indiscriminately burn everything … [including] civilians”. The documents so far obtained by Dr Fernandes confirm that Australian officials were becoming increasingly aware of the impact of Indonesia’s campaign of terror. One of the reports stamped “secret” reveals that embassy officials were shown photographs of the Timorese refugees in the border district of Bobonaro in August, 1978. “[Censored] said the condition of the refugees, many of whom had in any case arrived in a desperate condition, was extremely poor,” the document reads. “The Indonesian authorities were ‘doing almost nothing’ to alleviate the situation. And it warns that the problem in East Timor “will probably become worse”, and “unless there is firm [Indonesian] government action, people will continue to die of hunger”. That same year, General Yusuf told Ambassador Tom Critchley and the embassy’s acting defence attaché that one of the biggest problems in East Timor was the “270,000 women and children to care for”. Although the non-government agency The Australian Council for Overseas Aid provided some relief, food aid for the refugees was not provided until 16 months later, in late 1979. On viewing the documents, Mr Fraser questioned the extent of the famine and said he was not aware how many people had actually died. He said he “knew there were refugees”, but was not clear on the extent of the crisis. The former prime minister (1975 – 1983) was not convinced the Commission had accurately reported the number of Timorese who died. “The evidence [in the report] was not tested. It was designed to be a valve to release pressures. It is dangerous to take what is said as fact,” he said. He also doubted that the notes from the phone conversation with General Yusuf constituted a request for aid from Australia. He believed he had not previously seen the documents, as his custom was to mark all documents viewed with his initials. But Mr Fraser acknowledged that, arguably, he should have been shown them. He said Australia was “not powerless to do something in respect to humanitarian aid”. In 1978, Melbourne’s Sun News-Pictorial reported that “tens of thousands of Timorese have been starved into submission by the Indonesians”, editorialising that “as the corpses rot and the living cry for help, a timid shying away by Canberra . . . saying that we cannot risk offending the sensitivities of Jakarta”. 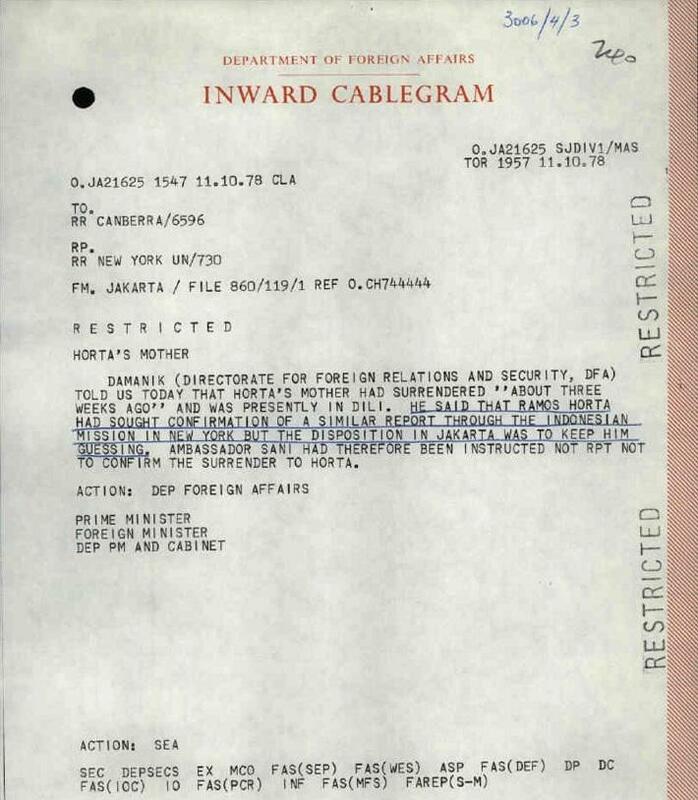 The documents obtained by Dr Fernandes also show that on December 16, 1975 the Indonesian Ambassador to Australia, Mr Hertasning, gave Foreign Affairs Minister Andrew Peacock an undertaking that Nomad aircraft purchased from Australia would not be used in Timor. But evidence being gleaned from the Indonesian military in April 1977 was that the Nomads had been used in Timor and were vulnerable to ground fire. A further record, dated December 1981, reports that Indonesia’s “Navy Air Arm has been strengthened with the arrival of two type N-22 [Nomad] aircraft from Australia recently”. Dr Fernandes believes documents denied to him could more closely tie the use of the Nomads with Indonesia’s military campaign in Timor at a time when it “was committing grave breaches of the Geneva Convention”. However, Mr Fraser dismissed this implication, arguing that Nomad were small passenger aircraft that could have been used for relief or medical evacuation. Cables sent from Jakarta by Australian officials in October 1978 also suggest that the pro-independence leader Ramos-Horta had been seeking confirmation from Indonesian officials at the United Nations in New York that his mother had been taken into custody. One of the cables, copied to the Prime Minister’s Department and Foreign Minister, notes that Ramos-Horta’s mother had surrendered “about three weeks ago” and was in Dili. Dr Fernandes argues that the documents reveal a “pattern of concealment” about what was happening in East Timor, about which there had been “bipartisan consensus”. ► This story was also published by ABC Radio’sThe World Today. * An earlier update published on Oct 7 suggested that Ms Bishop had rejected Mr Fraser’s call for the documents to be declassified. However, a statement issued by the Minister’s office was simply quoting DFAT’s original advice that the material should not be released.